Mountain trails and horses have formed a unique culture and lifestyle dating back 1000 years or more when Genghis Khan, Cortez and the Hudson Bay Company trappers travelled throughout the continents. Throughout history the amazing packhorse, the patient worker of the trail, supported crusades, invasions, explorations and now recreation. 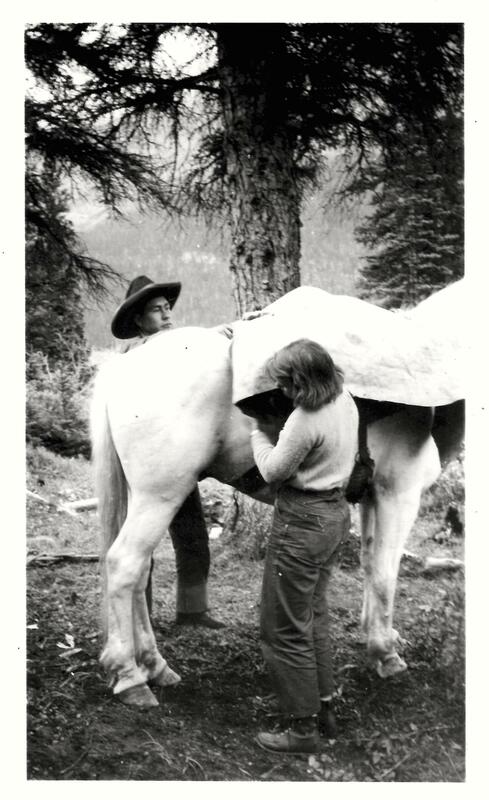 Our history and involvement with packhorses and diamond hitches spans over 100 years in the Jasper Park Area. 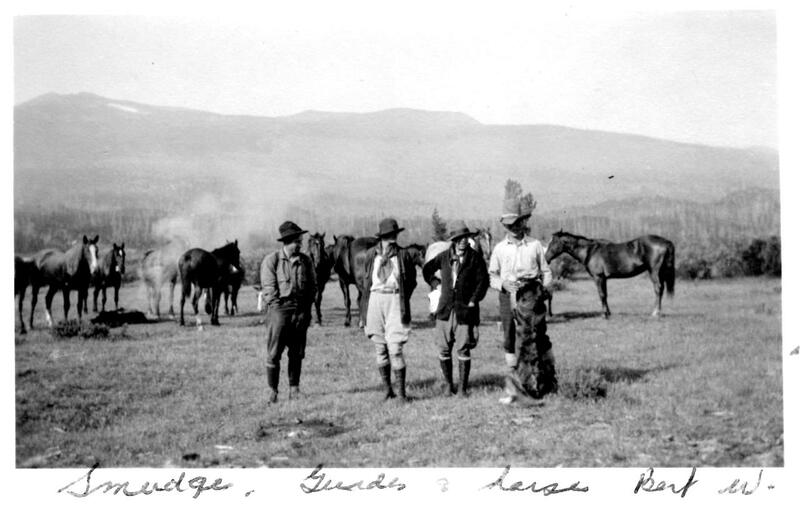 Our Granddad, Bert Wilkins and his brother-in-law, Donald “Curly” Phillips outfitted in Jasper in 1911, when Jasper was still called Fitzhugh. It became Jasper in the fall of 1913. 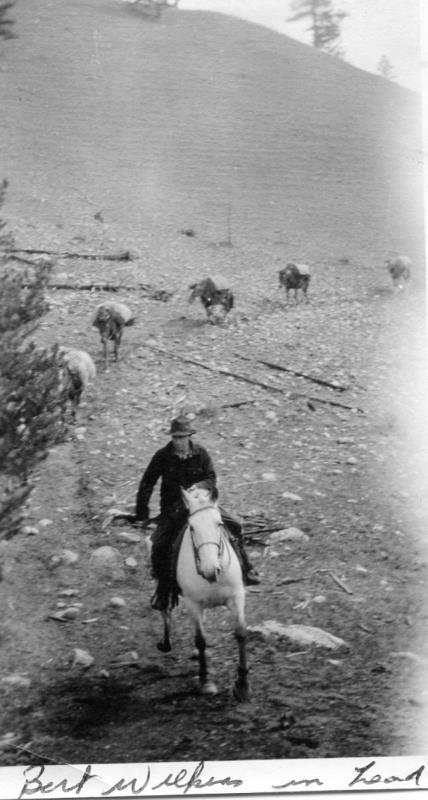 Great Uncle Curly built his corrals in 1912, below the hill on what is now known as Pyramid Drive. The corrals were located behind the present day Jasper Historical Building. Mr. and Mrs. Bob Doran later owned these Pony Barns. 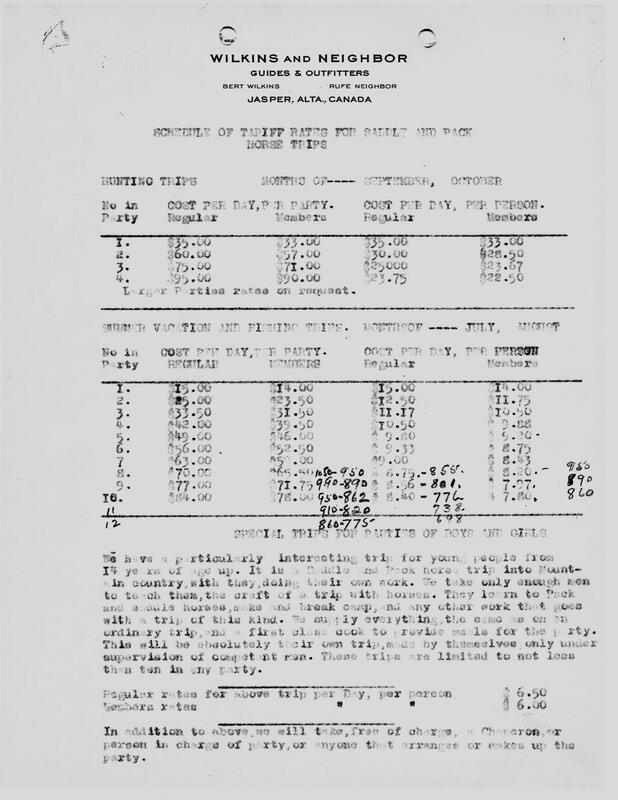 Granddad Wilkins and Great Uncle Curly Phillips were boyhood friends in the Muskoka district of Ontario. Uncle Curly lived on one end of the Lake of Bays, Dorset, Ontario, and Granddad lived on the other end of the lake, 16 miles away, at Baysville, Ontario. Together they worked on the river moving logs to the mill, guided in the woods and in canoes on the lakes. Granddad and Great Uncle Curly were men who knew how to read the land. Their expertise in Guiding would hold them in good stead when they journeyed west. 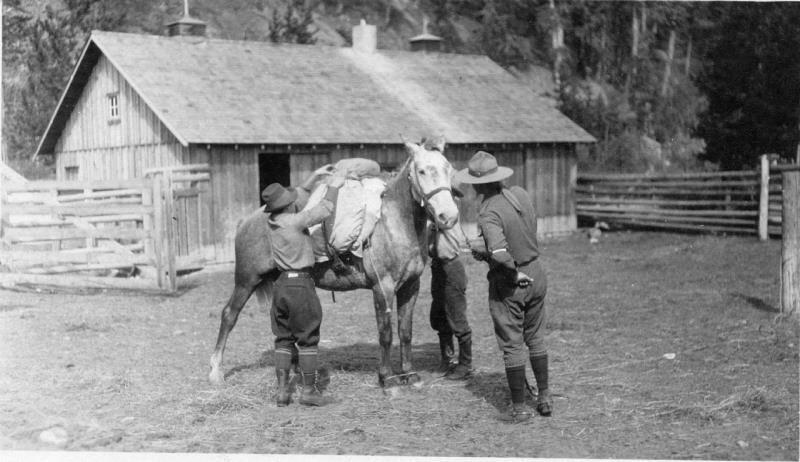 Horses were a new experience for them, but one they quickly learned to master as they began their Outfitting Business in 1911. 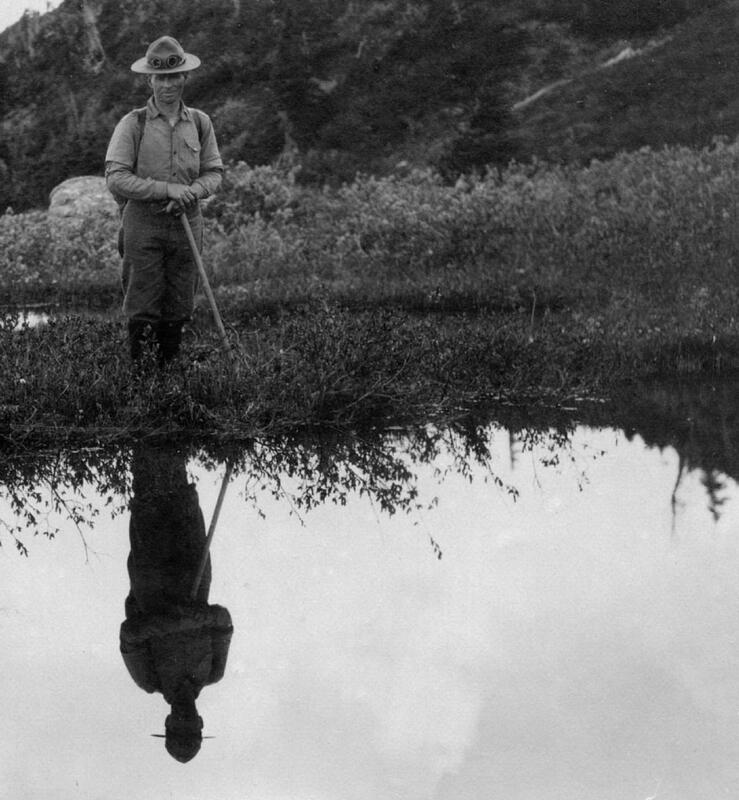 A great family friend of the Wilkins & Phillips family, Hirsch Neighbor, acknowledged Curly Phillips as the pioneer of outfitters in the Jasper area due to all the trails and tourist sites he had the vision and forethought to open. One of the sites, still being operated from today, is the Maligne Lake Boathouse, which was built by Curly Phillips. Hirsch Neighbor and Adam Joachim were two of the great guides that worked for Great Uncle Curly and Granddad Wilkins. 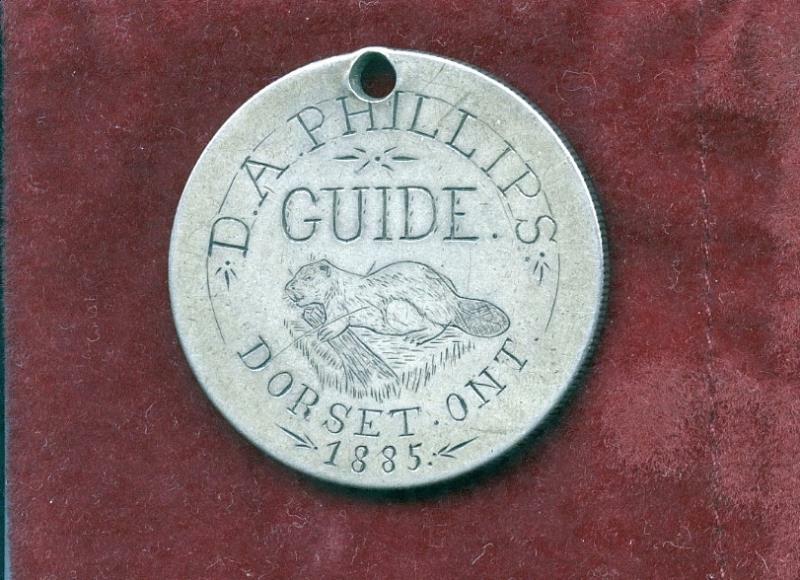 Granddad Wilkins married Curly Phillip’s sister, Ellen, who was affectionately known as Nell, on Wednesday the 28th day of July 1909, at Dorset Ontario. 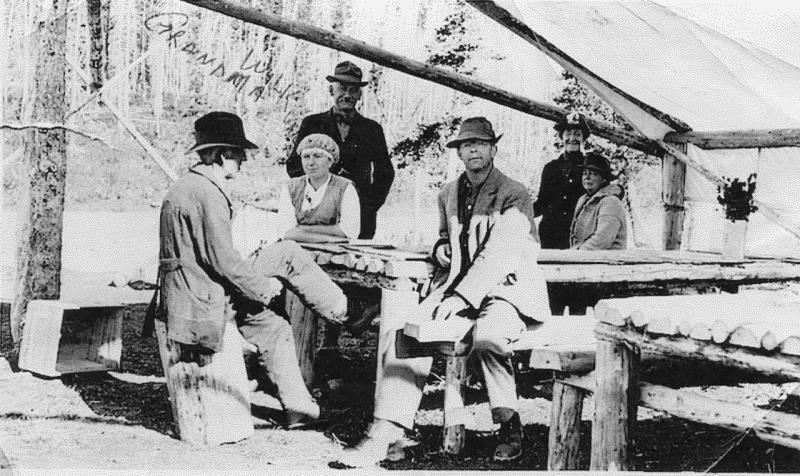 Granddad and Uncle Curly batched together in Jasper the winter of 1912. 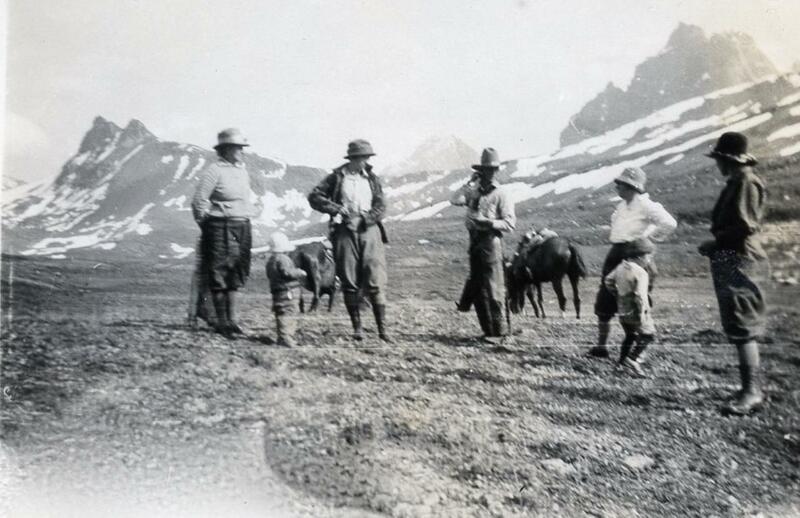 In March of 1913, Grandma joined Granddad and her brother in Jasper. That summer they outfitted parties from the camp they had at Mount Robson. Grandma cooked for the groups and continued being the gracious hostess to many guests who came to see nature at her finest in the beautiful and serene mountains of Jasper Park. 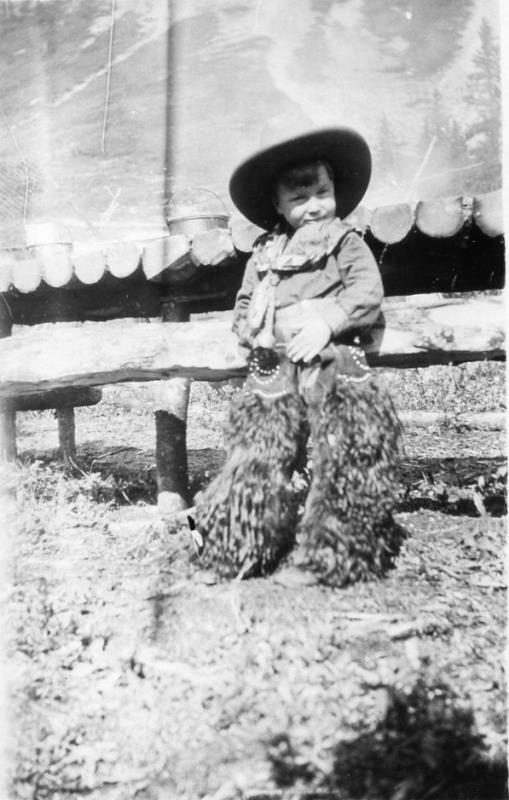 In 1922 Granddad Wilkins started his own outfit in partnership with Rufe Neighbor “Wilkins & Neighbor Guides and Outfitters”. Dad, Clarence Wilkins, was born at home in Jasper, November 01, 1923. A prominent guest was Miss Caroline Hinman. Miss Hinman arranged Summer Pack, Hunting and Canoe Trips in the Canadian Rockies from the Montana Border south of the province of Alberta, through Jasper, Mount Robson and Willmore Park areas to the Peace River in the northern part of Alberta. 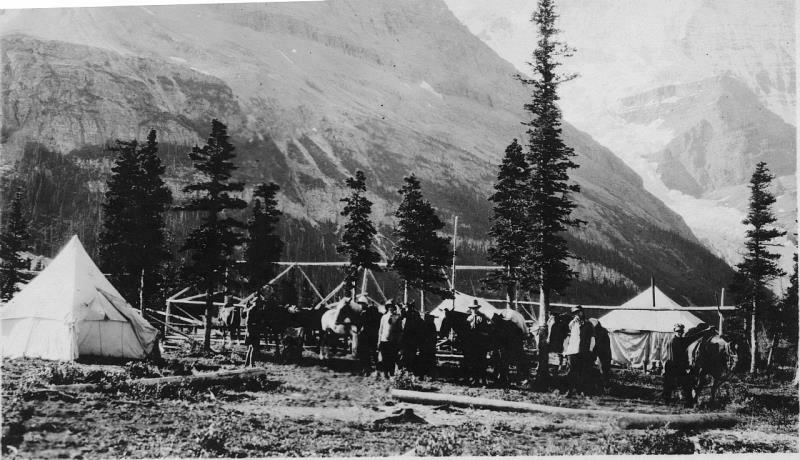 Starting in 1913, the Hinman trips in the Jasper and outlying areas were outfitted and guided by Great Uncle Curly Phillips and Granddad Wilkins. As we read about the areas they travelled, the trails and switchbacks they cut and cleared and the 30 – 60 day trips they made, we are amazed and awed. What a wonderful and exciting time when you compare the lack of technology and inability to transport and keep supplies preserved, how can one not be impressed? We feel honored to be able to read Granddad’s written words’ and the correspondence between Miss Hinman and himself. We cherish the memories of Dad (Clarence), Mom, (Geraldine Wells) and Francis (Neighbor ) when they reminisced about the trips with Miss Hinman and all the other trails that they have travelled. 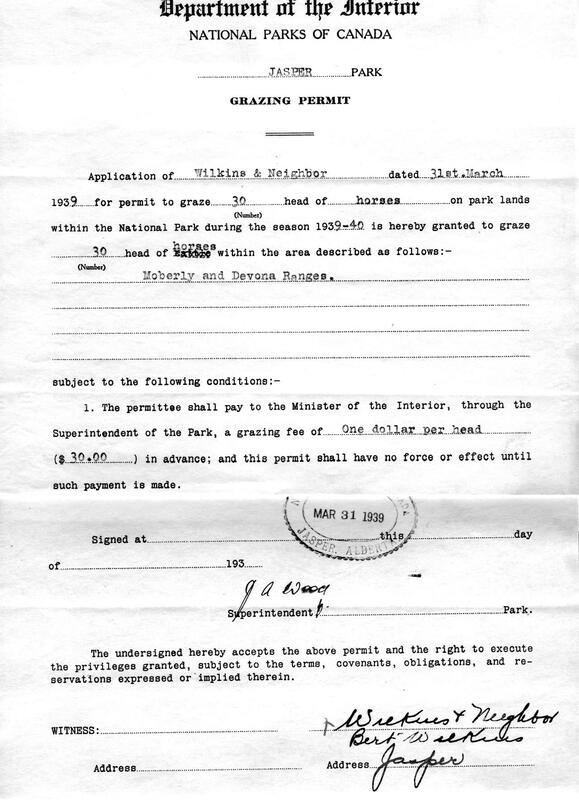 In the 1950’S, Dad was a Jasper Park Warden stationed at the Pocahontas district. 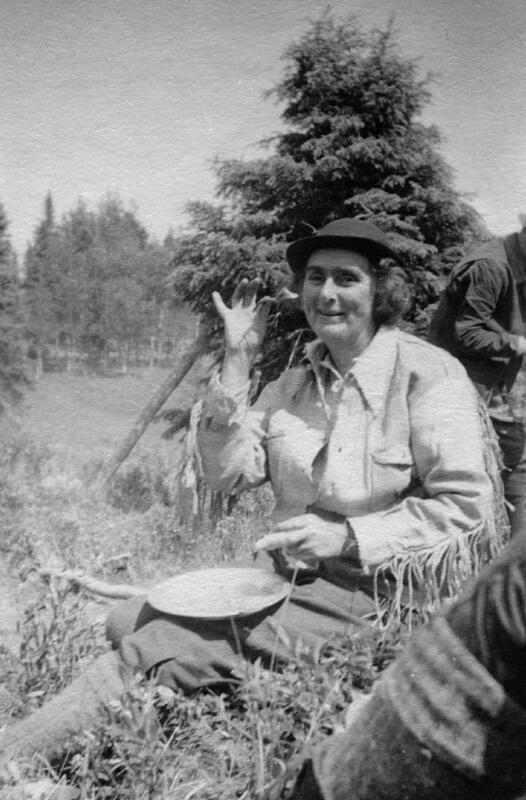 Miss Hinman while hosting a bus tour in Jasper stopped and introduced Dad to the guests on the bus as “the son of the outfitter and friend whom she had travelled with through many miles of this great and beautiful backcountry”. This is testament to the wonderful memories and friendships that are forged between Guests and Outfitters. Friendships continue for years, as was the case with Miss Hinman, Granddad, Grandma, Dad, Great Uncle's Curly and Harry Phillips. Miss Hinman had a great affinity for taking Youth Groups into the Canadian Rockies. 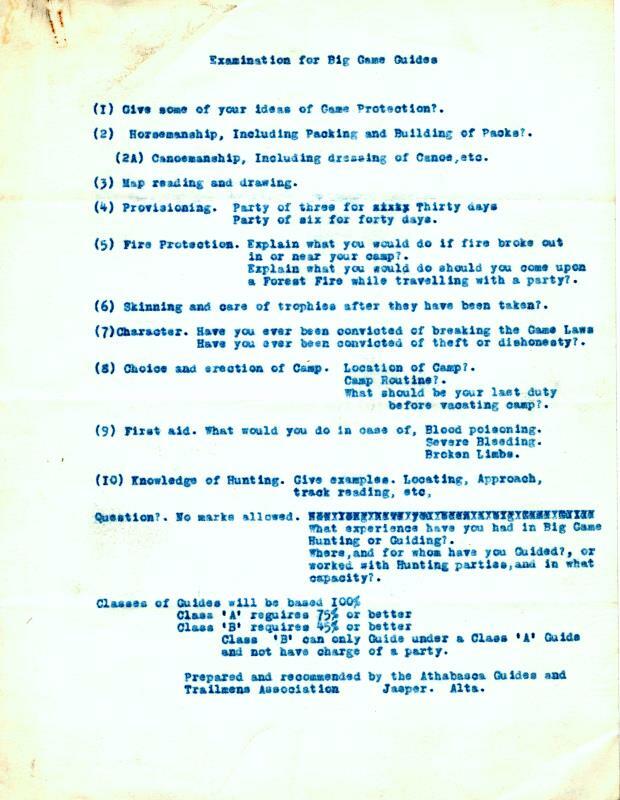 Her love of the mountains is expressed in her written letter to Outfitter Bert Wilkins, “I love the mountains and the northwest and camping and roughing it” (Hinman, January 8, 1940). 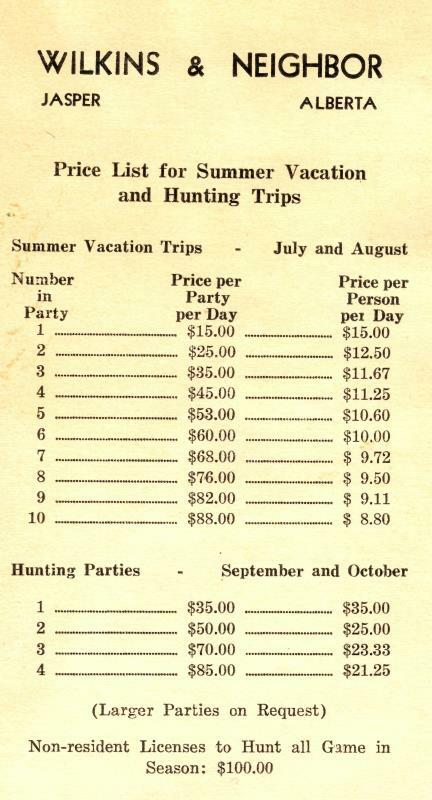 Bert Wilkins reply was “I know you would much rather take a pack trip, for one that has lived in the open, like you have, and tasted the best of life on the trips you have had, you cannot be satisfied with anything less” (Wilkins & Neighbor Guides & Outfitter, January 15, 1940). We as adults, with our children and grandchildren, have spent countless hours in the saddle travelling and experiencing the powerful feeling of freedom in the soul, a completeness that resonates with the mountains’ energy. Imagine knowing and feeling the beat of the earth’s energy, as the pulse of life moves up from the horses’ hooves into your spine, flowing through your chakras as your soul connects with the universal energy of those who travelled the trails before us. Knowing that our Grandparents, Parents, and Great Uncles have ridden these same trails definitely manifests the power of the interconnected threads between the universe and beyond. The very essence of life itself is felt when one has had the privilege to travel by horse through the mountains. 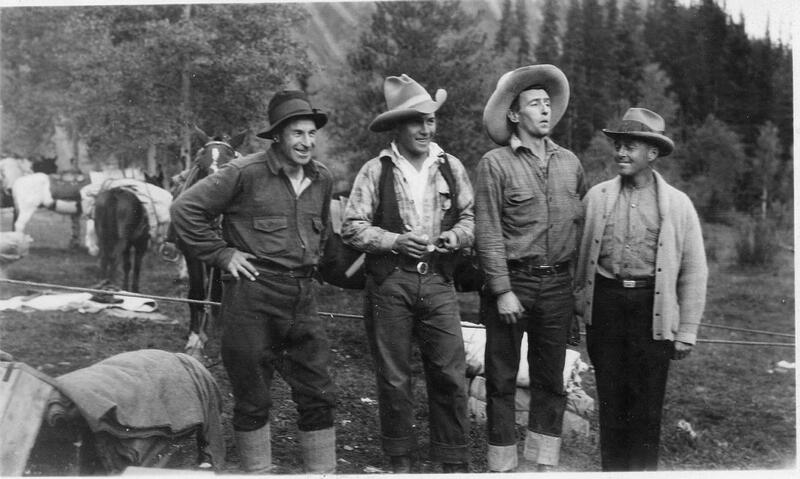 The traditional culture and lifestyle of Outfitting in Jasper Park's Mountains and surrounding area, is our heritage. We feel honored and proud to be part of this culture as we continue to follow the hoofbeats and footprints of our family who travelled the four points of the park before us.